Department of Mechanical Engineering, Dhaka University of Engineering and Technology, Gazipur, Gazipur-1700, Bangladesh. 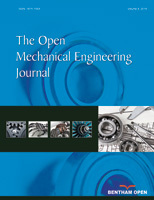 The present paper investigates experimentally the effect of relative humidity and roughness on friction property of mild steel under horizontal vibration. To do so, a pin-on-disc apparatus having facility of vibrating the test samples at different direction is designed and fabricated. The direction of vibration is horizontal. Horizontal vibration is created along (longitudinal direction) and perpendicular (transverse direction) to the sliding direction. The experimental setup has the facility to vary the amplitudes and frequencies of vibration while velocity of vibration is kept constant. During the experiment, relative humidity, roughness, frequency, amplitude and direction of vibration are varied. The observed ranges of relative humidity and surface roughness were 40%-80% and 0.125-2.5μm (RMS) respectively. Results show that friction co-efficient decreases with the increase of relative humidity for horizontal vibration. Friction coefficient is very high at very low roughness and it tends to be high at very high roughness for horizontal direction. It is also observed that the variation of friction co-efficient has a particular relationship with the relative humidity and roughness under horizontal vibration.